A librarian was hired to evaluate the programs and materials, consult with local Latino groups, and make recommendations to improve services; her report formed the basis for the library’s current work and their plans for the future. The most important result was new partnerships with Latino organizations that extend library services and provide outreach paths. The library now has a booth at the annual "Día de los Niños" organized by Generación Diez, which provides services to at-risk youth. Library staff conduct "story hours" throughout the year at the Lincoln Intermediate Unit, which provides supplemental education for children of migrant farm workers and ESL classes for adults. The Latino Services Task Force has helped the library connect with talented youth who might become part time employees; the library has found it can't yet compete for bicultural permanent staff and this would be a good temporary solution. The library also changed its geographic focus. The central library is in Gettysburg, where Latinos seldom come except for the Sunday mass in Spanish. But there are seven branch libraries located in small towns, four of them in the northern Adams County fruit-growing region where most Latinos live, and there's a bookmobile that goes everywhere else. The library has shifted the materials and programs to where the population lives and the bookmobile now stops regularly at the Migrant Center children's program and carries Spanish literature on its northern Adams County route. The collection was revised as well. The staff recognized that their "Spanish collection" -- translations of English novels -- didn't appeal to the target users. Now there are more ESL materials, CDs of contemporary Mexican singers, and Spanish-language religious books, popular magazines, and children's books. Translation of library materials into Spanish seemed like a good idea and was tried, but the brochures were not picked up. Outreach librarian Virginia Green prefers to post the occasional Spanish-language notice of special events at the branch libraries in the local grocery stores catering to Mexican families. The library Web site has a link to ESL classes offered by local service groups and might invest in a Spanish version of their own site in the future. Green is now organizing a library task force on Latino outreach, composed of librarians and community leaders, to set priorities. In the new Harbaugh-Thomas branch, in Biglerville, the largest branch in northern Adams County, librarian Jessica Laganosky welcomes twenty-five regulars who use the library weekly: the number is growing by word of mouth as kids bring their parents and help them use the computers. Lagonosky attended a Gates Foundation state- wide workshop for librarians on increasing services to Latinos; she came away with lots of ideas. She wants to attract Latino groups to the library'’s meeting spaces and add more bilingual and beginning-level Spanish books. Five years after the seed money was given, new programs are in place and in the works. Library director Rob Lesher sees it as a process of finding the right partners and investing resources strategically. Still to come: bilingual staff and more programs for adults. 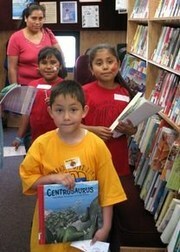 A small, personal seed-grant/donation results in expanded library services to an underserved Latino community. How can other donors and foundations find organizations that can help them nurture and grow a vision? We'd love to hear your thoughts. Kaye--Thank you for sharing your moving story. We become inspired every time that we learn another story of how individuals can act both locally and internationally and make a difference with a relatively modest amount of funds.